Ford is cutting 14,000 white-collar jobs in North America as it tries to turn round its flagging business. It is also to close 16 factories by 2008, instead of shutting 12 by 2012 as previously announced. It said these measures would help it reduce annual costs by about $5bn (£2.65bn) by the end of 2008. Ford had earlier said it would offer redundancy and early retirement packages to all of its 75,000 unionised US blue-collar workers. About 4,000 of the 14,000 job cuts have already been made earlier this year, Ford said. Redundancies of 25,000 to 30,000 of its hourly-paid workers - primarily involved in making and assembling parts for new vehicles - were announced earlier but will now be completed by 2008, four years ahead of the previous schedule. Ford said it would close an engine factory in Essex, Ontario, Canada, next year, and a stamping plant in Maumee, Ohio, US, in 2008. An assembly plant in Norfolk, Virginia, US, will close in 2007, one year ahead of schedule. And the firm, which posted a $123m (£66.5m) loss in the second quarter 2006, also now says its US plants will not see profit until 2009. Ford will also suspend its share dividend payout as part of the cost-cutting. "The steps we are announcing today are clearly needed to ensure the ultimate turnaround of the business in Ford's biggest and most important market," said chief executive Alan Mulally. As Ford's European operations are profitable British employees are unaffected by the announcement. 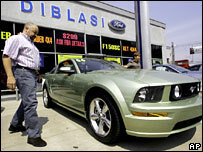 Argus Research analyst, Kevin Tynan, said that Ford was likely to continue losing market share. "That's going to be painful because that share is going to slip below the 15% they anticipate," he said. "It will go to about 12 or 13% before it stabilises so there will need to be additional costs taken out." He added: "Historically, the last thing the family wants to do is cut the dividend, so to suspend it speaks to how serious the situation is." When it first floated its redundancy programme the troubled firm said it was prepared to make individual buyout offers of up to $140,000 (£74,100). Separately, two senior Ford executives, including chief operating officer Anne Stevens, announced they were stepping down a week after new chief executive Alan Mulally replaced former boss Bill Ford. In January, the Detroit-based company had said it would cut up to 30,000 jobs and close 14 plants by 2012. In July, Ford hired an independent adviser to carry out a strategic review of the business in an effort to return to profitability. And last month, it announced its luxury UK car brand Aston Martin - made famous by James Bond - could be sold off under its shake-up plans. There are also suggestions that Ford needs to cut back on the number of models it makes under its eight brands. Ford currently operates the Ford, Land Rover, Mercury, Lincoln, Jaguar, Volvo and Aston Martin brands, and has a joint operation with Japan's Mazda. Around the globe Ford employs a total of 300,000 workers.